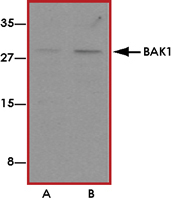 Sample Data :Western blot analysis of BAK1 in L1210 cell lysates with BAK1 antibody at (A) 1 and (B) 2 ug/mL. 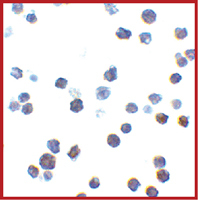 Sample Data :Immunocytochemistry of BAK1 in L1210 cells with BAK1 antibody at 2 ug/mL. 1. Lockshin RA et al: Cell death in the third millennium. Cell Death Differ. 2000; 7:2-7. 2. Cory S et al: The Bcl-2 family: roles in cell survival and oncogenesis. Oncogene 2003; 22:8590-607. 3. Heiser D et al: The Bcl-2 protein family and its role in the development of neoplastic disease. Exp. Geron. 2004; 39:1125-35. 4. Kiefer M et al: Modulation of apoptosis by the widely distributed Bcl-2 homologue Bak. Nature 1995; 374:736-9.